Tandem cold rolling mills can be basically split into two groups; sheet mills if they reduce hot band to sheet gauge or tin mills if they roll the same incoming material to tinplate stock. Key advantages of the tandem rolling process include cost reduction and good improvements in productivity especially when integrated with a continuous casting process. Rolling strip is widely used for automobile manufacturing, food packaging, household electric appliances, machinery, light industry, instruments, communications, military affairs and other fields. In cold rolling, usually no heat is applied to the work piece before forming. Only some special steels like spring steel, tool steel, tempering steel or alloyed steels may be subjected to heat treatment before pickling and rolling. However, frictional energy at the contact surfaces of the work piece is converted to heat. This heat may increase temperatures in rapid adiabatic processes over 100°C. The processing of steel in cold rolling mills differs considerably from the production in hot rolling mills. The raw material is first descaled (usually pickled, sometimes shot blasted and pickled), then cold rolled and heat treated. Further treatment steps include slitting, skin-pass rolling, coiling and packing. Tandem cold rolling mills are named by their stand arrangement and designed as “sheet mills” if they reduce hot band to sheet gauge or “tin mills” if they roll the same incoming material to tinplate stock. A typical five stand tandem cold rolling mill is illustrated in Figure 1. The tandem rolling mill consists of several stands that the work material constantly passes through. At each stand the thickness of the work strip is reduced a certain amount. The total reduction between the first and last stand can be significant. There are technical problems associated with tandem rolling, caused particularly by the fact that the speed of the work material increases as it passes through each stand. 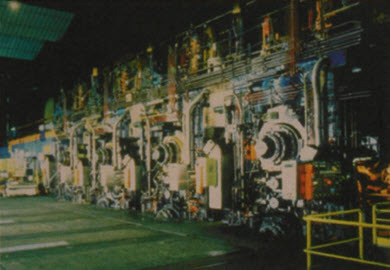 In manufacturing practice, various control systems are used to keep the entire operation synchronized. Once the particular technical problems and initial setup investment has been overcome, tandem rolling can provide a great advantages in the cost and productivity of an industrial metal rolling process. Tandem rolling can be even more advantageous when integrated with continuous casting. The tandem cold rolling process is composed of treading, acceleration, run speed operation, deceleration and tailing out. 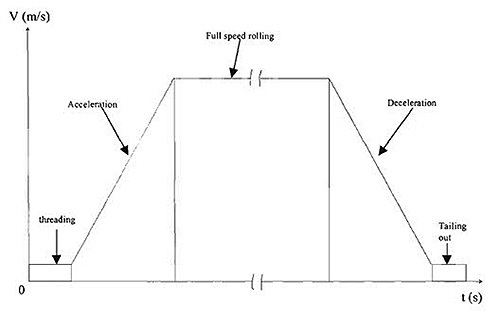 Figure 3 illustrates a typical speed diagram for tandem cold rolling. It shows the threading is the first phase of the rolling. Following the threading, dynamic control loops (AGC and AFC) are closed and corresponding actuators are activated. Then the mill speed is increased during the acceleration phase. Once the mill speed is up to the present maximum mill speed, the speed control system will keep the rolling speed in the vicinity of the maximum speed. This phase is defined as run speed operation. Towards the end of a coil, the mill is decelerated to the preset de-threading speed preparing the strip for tailing out. This session addresses individual phases and the disturbances accompanying these phases and control measures being taken in cold rolling.